Online college is a convenient, affordable, and accessible way to advance your education . . . if you do it right. If you do it wrong, it’s a great way to get ripped off. Getting ripped off is the worst. You feel like a sucker. You’re out a bunch of money. And whatever you just paid for, it sits on your shelf, or in your driveway, or down in your basement, silently mocking you for being a stooge. Of course, if it’s just a crummy vacuum cleaner, or a juicer that doesn’t work as well as it did in the infomercial, or a miracle cleaning fluid that actually just makes the couch-stain from your malfunctioning juicer ten times worse, it’s not that big a deal. But what if it’s a college degree, or a graduate degree? What if you paid tens of thousands of dollars for it, spent a few years earning it, staked your future career prospects on it, and bought a really swell frame for it — only to find out what all your prospective employers already knew? It’s completely worthless. What then? Your best bet is to avoid falling into this trap right up front. The Internet is brimming with educational opportunities. Of course, it’s also brimming with opportunities for con artists and scammers. The Internet is brimming with educational opportunities. Of course, it’s also brimming with opportunities for con artists and scammers. No small number of these opportunists have seized on the ever-growing online education sector, fueling the evolution of the “diploma mill” marketplace. For the most part, degree mills are online portals posing as schools. Often identifying themselves as obscure colleges or low-key universities nobody’s ever heard of, diploma mills will typically provide a degree in exchange for little more than payment information. If you’re looking to acquire a degree without taking any classes; interacting with any instructors; or learning one single, solitary new fact — this is the way to go. On the other hand, if you’re looking for a degree that will earn your more than just a skeptical side-eye from prospective employers, this is probably a bad way to go. And yet. . . . Remember, you’re pretty much on your own when it comes to not making really foolish educational investments. The thing is, there’s no law against becoming a diploma mill and selling fake degrees. Not only is the case law pretty sketchy on selling worthless degrees here in the United States, but a great many of these diploma mills operate outside of American legal jurisdiction. This makes tracking or curtailing their activities very difficult. Finding legal ways to interfere with their operations is downright improbable. The diploma mill game is a $200-million-a-year industry. That’s a lot of scratch for a scrap of paper worth only the cost of typesetting. To wit, CNN Money says that the diploma mill game is a $200-million-a-year industry. That’s a lot of scratch for a scrap of paper worth only the cost of typesetting. But it tells you that there’s demand out there. How many diploma mill “students” enroll because they think it’s an actual path to an education (as opposed to how many knowingly purchase entirely fake degrees to advance in their careers) is not entirely clear. Either way, it’s a poor investment. Know the difference between a diploma mill and an online degree, because even if you can’t tell the difference, future employers can. While there are plenty of consumer watchdog groups out there warning about the degree mill racket, there’s nobody stopping you from making a bad decision. That’s up to you. Inform yourself. Know the difference between a diploma mill and an online degree, because even if you can’t tell the difference, future employers can. Here are a few clues that you’ve stumbled across a diploma mill during your search for the perfect online college. This one isn’t as obvious as it seems. (OK . . . sometimes it’s obvious.) Something’s probably amiss if you’re looking at a school that was recognized by the Accrediting Council for Colleges That Operate out of the Employee Lounge at Some Guy’s Part-Time Gig in the Only Remaining Blockbuster Video Store on Earth (A.C.C.O.­O.E.L.S.G.P.­T.G.O.R.B.­V.S.O.E.). The only accrediting agencies that matter are those recognized by the Department of Education. But it’s not always that obvious. There are all kinds of official sounding accreditors out there that use words like national, association, and scholastic to sound super legit. But it doesn’t mean they hold any merit with graduate programs or employers. The only accrediting agencies that matter are those recognized by the Department of Education. For greater specificity, you can also consult the five dozen or so accrediting agencies listed by the Council for Higher Education Accreditation (CHEA). While these accrediting agencies will vary in their reputation, two things they have in common is that they are recognized by the Department of Ed and none of them will accredit diploma mills. Wikipedia maintains an ongoing list of “unrecognized higher education accreditation organizations.” If you’re at all skeptical about the agency listed on your school of choice, see if it shows up here. If you are looking at an online college that is not accredited by an agency recognized by the Department of Education, it means that school lacks the authority to provide you with access to student aid. This fact should give you pause whether or not you yourself plan to access student loans or aid. Bottom line: one of the best ways to avoid getting taken in by a diploma mill is to only attend an online college with Department of Ed-recognized accreditation. Truthfully, accreditation can be a bit more complex than that. Some reputable schools may be in different stages of earning their accreditation. This is a subject worthy of your due diligence. To learn a little more about navigating the tricky accreditation landscape, check out our accreditation guide: Who’s Accrediting the Accreditors? There’s even a handy flow-chart! Colby the cat earned a diploma signed by the school’s president and its academic dean. This one is fairly straightforward. If a school’s only admission requirement is a valid credit card, chances are the bachelor’s or master’s degree on offer has no value. I’m not talking about a college with a low academic bar for entry — some online schools are designed for accessibility, regardless of the GPA or College Boards performance you bring to the table. That’s OK. But you should take a closer look if your school of choice doesn’t require a high school diploma or even proof of your identity as a human being. HireRight tells the story of Colby, a cat that applied for and was awarded an executive MBA from a faux university located in Plano, Texas. Colby the cat earned a diploma signed by the school’s president and its academic dean. Unfortunately for Colby, future employers aren’t very likely to be impressed by the alleged advanced degree. Of course, the logic above applies to academic degrees, and not necessarily to practical or trade school certifications. Admission requirements for practical certification programs can be pretty lenient. But one thing that readily differentiates a real trade school from a fake academic school is the presence or absence of classes. How can we be expected to teach children to learn how to read if they can't even fit inside the building? 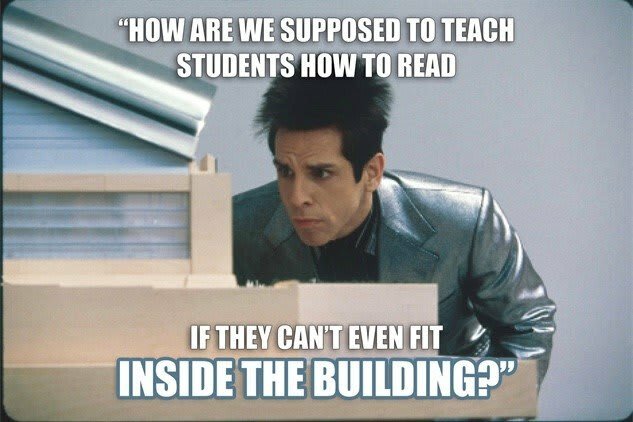 If you’re checking out the Derek Zoolander Center for Kids Who Can’t Read Good and Who Wanna Learn to Do Other Stuff Good Too and you find out that there’s no curricula, majors, or faculty, that’s probably not a good sign. Diploma mills often claim to award you your degree simply for your “real-world experience.” In other words, if a school offers you a degree in exchange for a fee and your usual weekly hours as a receptionist at a Botox clinic, it’s probably not real. Real colleges require real courses, list real faculty on their websites, and can identify clearly delineated curricula in association with various degree programs. Another red flag is a college that offers you your degree for a flat fee. Real colleges charge you for credit hours (or even quarter-credit hours). If somebody offers you a degree for one low, low payment of $999.99, that’s basically the college equivalent of buying a used car over eBay. Not charging per course or credit kind of goes hand-in-hand with not actually offering any courses or awarding any actual credits. So before you even get a chance to dive into the curriculum, chances are the payment process will offer some clue that this isn’t an actual online college. If your college has a fraud rap sheet like a Nigerian prince’s, it’s probably a criminal enterprise. Usually, it only takes a little tiny bit of Internet sleuthing to find out if your college of choice has ever been the subject of fraud charges, accounting irregularities, recruitment indiscretions, or consumer grievances. If your college has a fraud rap sheet like a Nigerian prince’s, it’s probably a criminal enterprise. GetEducated.com offers a resource that lists more than 300 known degree mills. This is a good place to start if you suspect a college on your list might fall into this category. Don’t let the preponderance of fraudulent institutions out there frighten you away from a high-quality online education. In addition to knowing what you should avoid, you should also know what to look for in an online college. 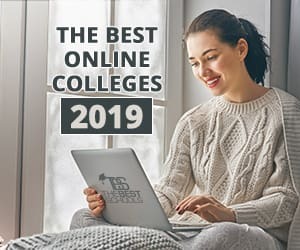 Start with our constantly updated list of the 50 Best Online Colleges & Universities 2019. You’ll find a ton of awesome, accessible online college experiences, all with the kinds of courses, credits, curriculum, faculty, and reputation that real, actual schools tend to boast. Don’t let the preponderance of fraudulent institutions out there frighten you away from a high-quality online education. It’s still convenient, affordable, and accessible. But you have to know what you’re looking for.